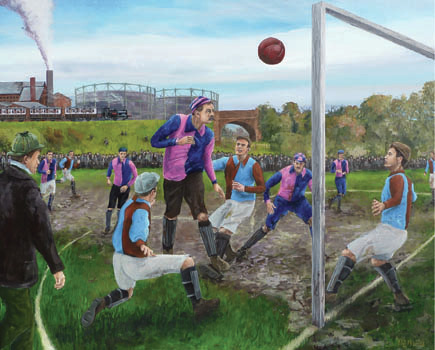 This was a commission to depict a football match between Luton Town and Notts County from 7th November 1885. The client furnished me with lots of background information including a black and white portrait photo of the Luton team, various period images and the kit colours, a map of the location and reference for the cooling towers. Although I did a bit of my own research into train liveries etc, there is plenty of artistic license going on here. Quite how the power station or the railway bridge looked or exactly which of the players wore caps and which colour, is up for debate. As the reality has got lost in the midst’s of time one has to just compose with confidence and with colours and shapes that benefit the composition. A lot of drawn images of the time suggest a less dynamic game than today’s. Indeed Harry Enfield’s skit of period teams wandering around the pitch in baggy shorts smoking pipes seems to reflect our understanding of this timeframe. I wanted a slightly more dynamic look and so used various images of premiership players as reference. The relative geography of the pitch to the embankment influenced the composition, but I was able to play with various outline drawings of figures in the computer to create a good composition. I created more figures than required and deleted as appropriate. All of the figures were from different photos to avoid plagiarism and indeed some limbs / heads were rotated or transferred and reflected. Hopefully the identity of the famous players used is suitably disguised. The painting took a fair while, being interrupted for a few months with the need to create work for my “Urban and Rural” exhibition last year. Completion became somewhat of a relief, though the project was most educational and interesting. When I handed over the commission, the client named the Luton striker while describing the scene. This gave me great satisfaction, and leads me to believe that I have created an accurate, believable representation.